Hotel Moskva, a Belgrade landmark built in the Russian Art Nouveau style, is one of the most important architectural gems of the capital of Serbia. The hotel was officially opened by King Peter I of Serbia (Petar I Karađorđević) in 1908. With its façade comprised of decorative taupe and emerald ceramic tiles, it is one of Belgrade’s most recognizable landmarks and has been under state protection as a cultural and architectural monument since 1968. 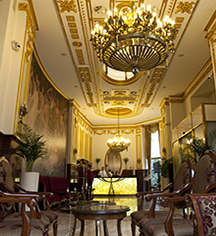 Located on the Terazije Square in the historic city center stands this iconic four-star, 123 guestroom hotel, which is the only hotel in Belgrade without a a number 13 room or apartment. The hotel has welcomed countless visitors since its debut, with many of its suites named after notable guests, including Albert Einstein, Robert de Niro, Indira Gandhi, Luciano Pavarotti, Maxim Gorky, and Alfred Hitchcock. Pictures of celebrated guests line the hallways; these include Leon Trotsky, Rebecca West, Richard Nixon, Leonid Brezhnev, Yves Montand, Vanessa Redgrave, Brad Pitt, and Nikita Mikhalkov. 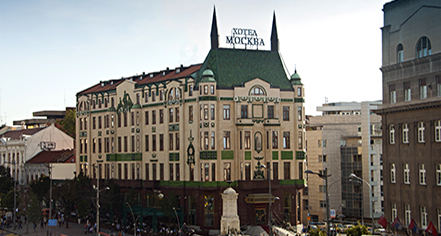 Hotel Moskva, a member of Historic Hotels Worldwide since 2016, dates back to 1908. Robert de Niro, Albert Einstein, Indira Gandhi, Luciano Pavarotti, Maxim Gorky and Alfred Hitchcock are famous guests who left their permanent mark – six suites are named after them. Hotel/Resort Fees & Taxes: A tax is imposed by the city: RSD 151 per person, per night. Parking: Self-parking: Available. RV, Bus, Truck parking: Available. Hotel Moskva, a Belgrade landmark built in the Russian Art Nouveau style, is one of the most important architectural gems of the capital of Serbia. The hotel was officially opened by King Peter I of Serbia (Petar I Karađorđević) in 1908. Learn more about the History of Hotel Moskva .